Andrei Kostin, 61, the head of the state-owned VTB Bank, has enjoyed a long career as a state official and state banker. His reputation among his international banking peers does not highlight expertise in treasury operations or investment ingenuity. Rather, Kostin is reputed for being the trusted executor of his shareholders’ instructions, deliberative, loyal, cheerful. Since Kostin was head of Vnesheconombank (VEB) between 1996 and 2002, and head of Vneshtorgbank (VTB) since then, the instructions Kostin is trusted to follow come from the President, the Prime Minister and the senior state officials who rule the VEB and VTB boards, as well as from the security services with which Kostin was acquainted early in his government career. President Vladimir Putin made an exceptional public token of this trust by honouring Kostin’s 61st birthday last month with the gift of a Chimes wristwatch. When Kostin makes public statements in western media, it is understood he aims to reflect what the Kremlin has decided; he is not lobbying a personal or factional policy line before the decisions are made. So what were Kostin’s instructions when in Davos this week he declared, in reply to a question about the threat of US Government sanctions against Russian oligarchs: “I don’t think that everyone will now start to run away like cockroaches that disappear through the floorboards. The business community is generally calm”? Kostin may have been speaking for the one in nine Russians who recently told a national opinion poll that they are not afraid of anything in particular. The percentage was relatively unchanged since 2016, but it is double that recorded in 1989. Compared to the end of the Soviet period, Russians are evidently much less afraid of illness for themselves or their families, war, old age, or natural disasters. But compared with then, they are much more afraid of poverty. Compared to a year ago, as the US war against Russia intensifies, fear of illness and of war are up only marginally; fear of ethnic conflict (read terrorism from Islamic sources) is growing more prominently. A national survey by the semi-official Russian Public Opinion Research Center (VTsIOM) – carried out in June of 2017, four months before the Levada Center poll – reported that anxieties over consumer price inflation and international conflict were rising. VTsIOM’s fear index, a composite measurement of responses to specific sources of concern, was up by several points for price inflation, war, and illness, compared to the early months of 2017. VTsIOM analyst Oleg Chernozub was quoted in the Center’s press release as saying the fear index was “significantly higher than the comparable periods in 2016 and two years ago.” Chernozub also predicted that the fear index will worsen. “The indicators continue to deteriorate…fears regarding income, unemployment and internal disorder also show an adverse trend.” That was six months ago. What is the VTsIOM fear index showing now, Chernozub was asked? 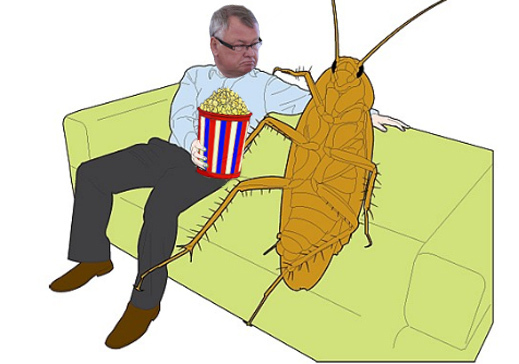 The cockroaches Kostin was speaking of this week aren’t poor. So the Levada Center which did the first poll, and VTsIOM which runs the fear index were asked to say what are the greatest fears for the high-income respondents in their samples, and what is the trend for this group over the past few months compared to the sample norm. Levada refused. VTsIOM also refused, the spokesman for the Center, Maria Bagirova, adding “we don’t have special polls for rich; we observe all social groups.” She refused to allow Chernozub to respond with a comment. VTsIOM reported six fear index polls in the first half of last year, one every month until the end of June. Bagirova claims this year there will be one every six months, and the new one will be released “soon”. As Kostin implied, Russians with plenty of money have the means to pay for running away, or for staying home and getting treatment. Brain Clinic and Psychiatric Health are two Moscow-based clinics offering professional treatment of fear for those with the means to afford it. Dr Vladimir Kozlovsky (pictured below, left) runs the first; Professor Vitaly Minutko (right) the second. The two clinics were asked to say, in general, what are the main fears reported by wealthy Russians, and whether such fears appear to be rising or declining in recent months. Both clinics refused to answer. This is “secret information”, they said.